Supplied by DHD Dolls House Direct. One of the largest Dolls House makers in the UK with over 60 designs to choose from. Owners of Hearth and Home Miniatures and Lili-Anne Bathroom collection. Churches of this design can be found in most villages throughout the UK. Please see our web site for full list of Dolls Houses. Stands at 320mm (13") high x 450mm (17") wide x 258mm (10) deep. All our1/24 houses are made from 6mm MDF (external and internal walls). And are designed and built in Carmarthenshire. DHD dolls house direct aim to supply top quality miniatures accurately scaled to 1/12. Our British made dolls house food items look just like the real thing. Our own range of Houses / Shops are all inspired by real buildings. The Largest Dolls House Maker in the UK over 60 different designs. Most made in both scales 12th and 24th. Established 1989 entering our 29th year. Board we use is Medite:. Mixed softwood, polymerised resin, paraffin wax. Moisture, green dye and formaldehyde. 8 mg/100g - Class E1. Full data safety sheet can be viewed on line. 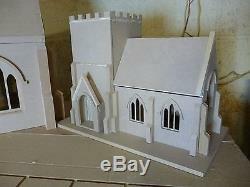 The item "Dolls House 1/24scale Village Church Kit 24DHD039" is in sale since Monday, May 20, 2013. This item is in the category "Dolls & Bears\Dolls' Miniatures & Houses\Dolls' Houses". The seller is "dolls-house-direct" and is located in Velindre, Carmarthenshire. This item can be shipped worldwide.